We all want our moment in the sun... the day we step out of our black stretch limo and place our Louboutin-ed or Blahnik-ed foot on to that plush red carpet. We dream we are preparing to accept a Grammy for our best selling, radio over-playing song or to accept an Oscar for our dazzling performance in the year's most-watched movie. Sigh, a girl can dream. And dream I will. Who wouldn't want to make their red carpet debut in these evening gowns showcased this past week? 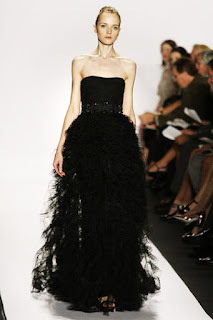 Maybe the LBG (long black gown) by Oscar de la Renta? Maybe ombre by Carlos Miele? 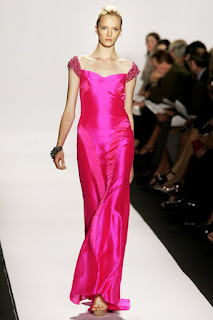 Maybe hot pink in Badgley Mischka? Angelic white by Pamella Roland? Maybe gilded by Carmen Marc Valvo? Or silver chic by Monique Lhuillier? 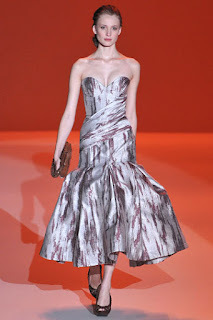 Maybe volume and perfect bustier by Carolina Herrera? Maybe something short by Marchesa? Which would you wear for your moment in the sun? PS: Check out the Fug Girls' NYFW round up here. I'd choose between the black gown from Oscar dela Renta or the silver gown by Monique Lhuillier. Do you know that she's from my country? We're so proud of what she has achieved. Gorgeous red carpet picks... it is so hard to choose a fave, but I really like the length and shape of that Carolina Herrera! I'm a sucker for anything Ombre! and that Carlos Miele dress is absolutely gorgeous!! I would wear the Oscar de la Renta gown! Im thinking my wardrobe needs some ombre by Carlos Miele! If I were to choose out of those, I'd pick the de la Renta.